I’ve tried using Garmin VIRB Edit to produce an overlay on my video, to show the metrics. It works quite well, even if it does stretch out the editing process. Load into VIRB, and place GPX information with the file, aligning it with an arbitrary point. Heavy edits in Premiere Pro and AfterEffects. I love pouring over data. I collect it how I can, when I can and as often as I can. One of the tools I use to generate some stats when I’m cycling is my Garmin 510. I thought I’d just take the time to show how I have mine setup, as there are plenty of reviews on the unit already. So, there are a few activity profiles you can choose from. The way I have mine setup is with three profiles, Train, Commute and Race. I use Train the most, followed by commute. Train is setup to show the most information on each of the available five screens. The last two on this, elevation and temperature are not important metrics, and can be removed. But everything else, is what I’d call an “At a glance Metric”, ie, something you want to see when you glance down. This is where I have the unit display data when I ride normally, as it is the most important set of metrics. Elapsed time – The total time the unit has been recording, including auto-paused time. This is the screen I take in when I stop, as it shows the information as a set of averages. This is probably the second most active screen I use, especially when I’m pushing. I can keep myself in a HR zone, and closely monitor when I need to push, or calm down. I find the heart rate graph to be incredibly useful to see the pattern over time. I show laps on the final screen, not really something I use a lot of, but its good to have it here. I have the profile set to Auto-Lap at 2 miles. I dont often take much notice of laps when I’m riding, but it comes in handy on RideWithGPS when I review. When I’m done with the ride, I’ll head on over to RideWithGPS.com and look there. By far RideWithGPS has the best data handling of the main cycling sites I use. (Strava, Endomondo, Garmin Connect and RideWithGPS). Head on over, select one of my rides on the site, and see the power you can have, to break rides down into sections, overall stats, and stats on selected parts, it really is very powerful. So there I was, happily cycling down the road, when some nobhead in a huge 4×4 passed me so close, I could of smacked the side of his car. Please give room when overtaking cyclists. Please. I find it quite amazing to represent the distance I’ve so far cycled like this, as of this posts date I’ve logged 515 miles this year. (From September) That would take me right through the Netherlands and into Germany. I find myself enjoying riding in traffic. As those cars are sat there, waiting to move, I can be zipping past, on my way just filtering through. It does however require attention, more attention than if you were driving. You have to anticipate peoples moves, the space they leave, and work out your surroundings, and the road every few seconds. Then you get the occasional idiot driver, who does not leave room, passes you too close or tailgates. It can be quite unnerving to have it happen, but it does happen. Several hundred videos on YouTube showing it happen. Speaking of which, the riders that post some of these videos, are shall we say, a little militant. The Worst being SonOfTheWindINC, showing drivers a red or yellow card for their driving, while filming them with more GoPro Cameras than humanly needed. One Video shows him chasing down the road, after another cyclist who hit a woman, horn blaring and shouting before attempting, and failing, to perform a citizen’s arrest. Its Cringeworthy. Other YouTube posters often seem to go out of their way to court aggravation, admittedly after the misdeed of the driver, but still aggravate the situation. Myself, if I catch something, I let it go and then post it on YouTube if needed as a warning to others, or a lesson to be learnt. Never would I chase down the driver and confront them. I dunno, I’m not into “reasoning” with idiots because reason doesn’t work on the terminally stupid. I’m not going to waste time trying to educate the mentally under-developed. This is my steed. It’s carried me in comfort for a good few miles. It’s only issue is a noisy rear wheel when wet. I’ve not yet managed to work out why.. But its not a major issue. I’ve added quite a few bits over the months. The biggest add I did was fit the mudguards. It was a hassle to fit, but eventually they went on, and what a difference they make when riding in the wet. Gone has the wet arse feeling and dirty clothes. Easily the better addition. The tyres I changed to are Schwalbe Lugano They are a cheaper tyre, but I have nothing but praise for them. They have lasted miles, not a single puncture. They have grip in all weathers (apart from sheet ice) and I have confidence in the just whatever I throw them Into. I did also buy a set of continental Gatorskins, in a wider set, but found them to give a really harsh ride. They also fouled on the mudguards. Now I just ride the legano on lower pressure if very wet. 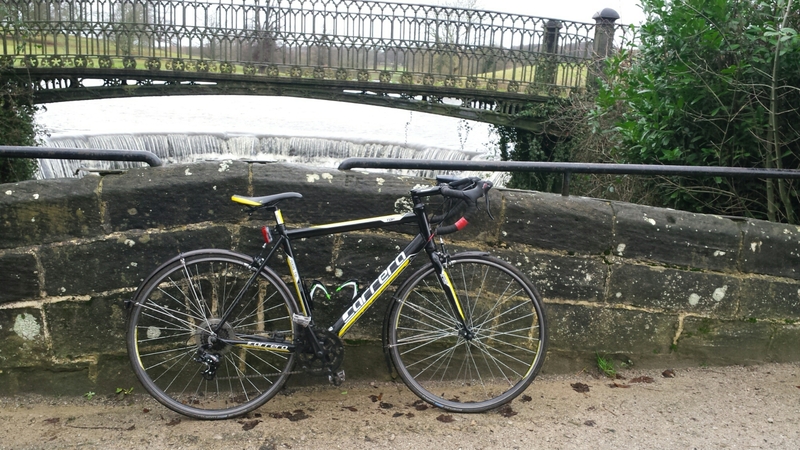 All in all, the bike has served me well, and I’m sure it will continue to do so, until I can afford a step up.. So I was sat here the other day, looking through the statistics on my ride and noticed how much further and faster I’m going. On one segment, I posted my second ever fastest time, yet have no recollection of trying, was just moving along at a nice speed. When I started, it was an effort to get better times. Hell, it was an effort to just get up an incline. Now I’m just watching them fall, and eating up the hills. Often not even noticing an incline. Nothing too steep though, just the hills around Harrogate. It might not be impressive to some, but to me it means I am improving, and getting better. I feel better, I look better and most of all, really enjoying it. Cycling gets into the blood, becomes a part of life. It’s weird but in a good way. What ever your feeling goes on the bike replaced with a sense of freedom. It’s a simple pleasure that’s hard to place into words. Get a bike go and experience it. 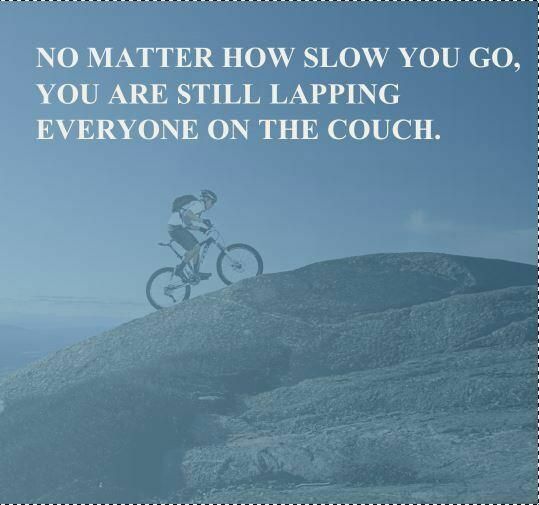 Someone once said to me, it never gets easier you just get faster, and that is so true.